Here's my Late-'50s Follis, which I am slowly working on resto-modding. The 50's Maxicar hubs and Mavic rims were too valuable for me to ride on, and this needs to be a rider. Plus I needed the cash. The Huret was interesting, being the very first year of the Allvit. It looked totally different from the Allvit we all know so well from all those Schwinn Varsities. Cool but not right for this bike, which has Campy dropouts. So I threw some cheap eBay 650b wheels on it to try out the concept, see if I like it this way. The wheels are crap and won't stay on this bike, though the tires might -- they're Hetres that were "shaved" by Peter Weigle to make them faster and lighter., more supple. If I like the bike enough as a 650b, I'll increase the fork rake, do brazed-on brake pivots and a custom front rack, and put a nice paint job on it. No interest in building it with all '50s parts, so it'll be a mishmash of '60s and '70s, with LED lighting from the current era (no pun intended). Hubs will be the much more common Maxicars from the '70s, rims will be Mavic Module 4 (650b, natch), late '70s or early '80s, with '70s Robergel Trois Etoiles light gauge butted spokes. This rear derailer is interesting -- it's a hybrid made out of most of an old Record, the steel/bronze one from about 1965. But the top knuckle of the parallelogram is from a Sport. Not Gran Sport, just Sport, the one with only a single pulley, and a spring in the top pivot. The Sport was a terrible mech that never should have existed. But using that sprung top pivot, riveted to a Record with a sprung lower pivot, makes something Campy never did back then: a mech with two sprung pivots -- like a Simplex. This massively increases the range of gears it can handle. See here for an album dedicated just to the derailer. It shows it shifting a 14 to 28 freewheel with a wide-range triple in front, 21 tooth range. It runs quiet in all gears including big-big and small-small, not maxed out, could handle a wider range. Then as an experiment, I replaced the Record pulley cage with the one from an early-'70s Shimano Crane GS. It bolts right on! That allows a bigger cluster -- it's got a 34t on there in the picture, and still easily shifts to all the gear combos, not maxed out. I may put the Campy cage back on though, depends on whether I want gears that low. The Crane cage does look cool there though -- do you agree? The frameset is a gem, really fine workmanship, with artisanal details like the rear brake running inside the toptube, and both rear bridges curved. The lugs have been fillet-brazed over at the transitions, then filed smooth, just to make the radius from one tube socket to the other larger/swoopier. That's a lot of skilled labor, just to make the lugs look cooler, to the rare discerning customer who can even tell the difference. I used to do that on some custom frames I made, but I stopped because no one noticed, or wanted to pay extra for that -- I realized I was only doing it to please myself! The fork crown is a Nervex Pro, but with some brass built up here and there, mostly underneath, to let them file it into a more pleasing shape before polishing and chroming. A lovely touch that almost no one will notice, especially after the brake and fender are mounted. The fork blades are the old rapid-taper ones that are very small through the curved part, making a more shock-attenuating ride on rough stuff. They're 2 mm smaller diameter than the "Toei Special" Kaisei blades that are currently the comfiest blades builders can get today. I forget the overall F&F weight but I remember being pleasantly surprised -- it's light for a 65 cm frame. A keeper for sure. 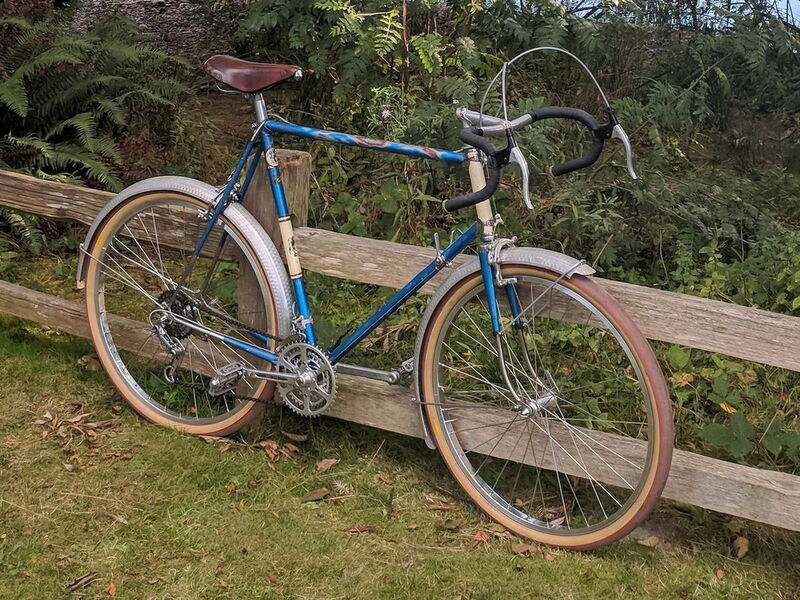 I just have to decide whether to return it to a road racer as it was originally, with Beborex sidepulls and sew-ups, or continue down this "classic rando" path as it's currently set up.